Hawken and I spend some quality time in front of Abby’s camera this afternoon. He is a beautiful dog. 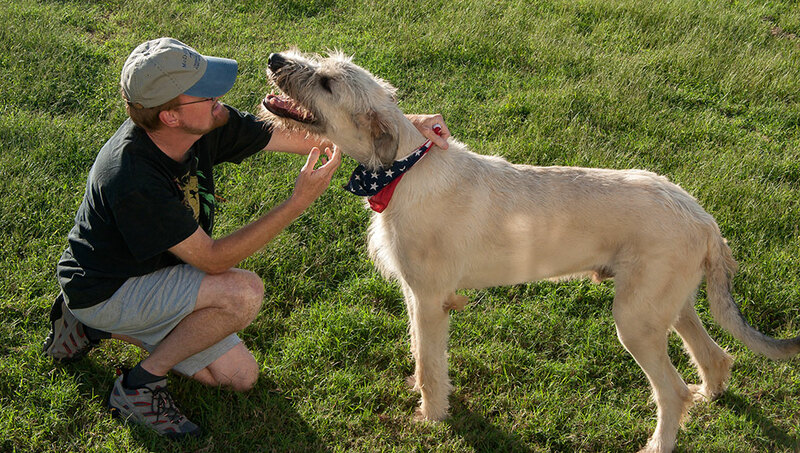 I told my wife Abby I wanted a picture of me playing tug-of-war with Hawken the Irish Wolfhound, since it’s his favorite thing to do with me, and since he has grown some since our last photo session. Sierra tries to look pitiful in her teal sweater, but don’t let her fool you: she is spoiled rotten. Before we could photograph us, Abby asked me to put a bandana on him, and we chose one of his U.S. flag bandanas. Putting one on him is an epic battle for me, since he thinks it’s a chew toy, but Abby is apparently a dog whisperer, and had no trouble at all. It was a fun photo session that included Abby trying to “ride” Hawken for a photo but finding him too tall to mount, and Hawken stealing Abby’s water bottle to keep as a toy. 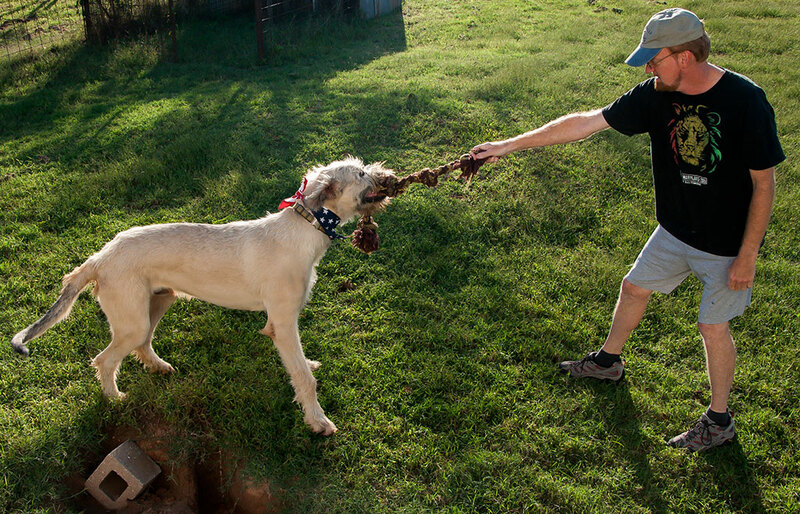 Tug-of-war is a puppy thing, and Hawken, thought huge, is still just 10 months old. 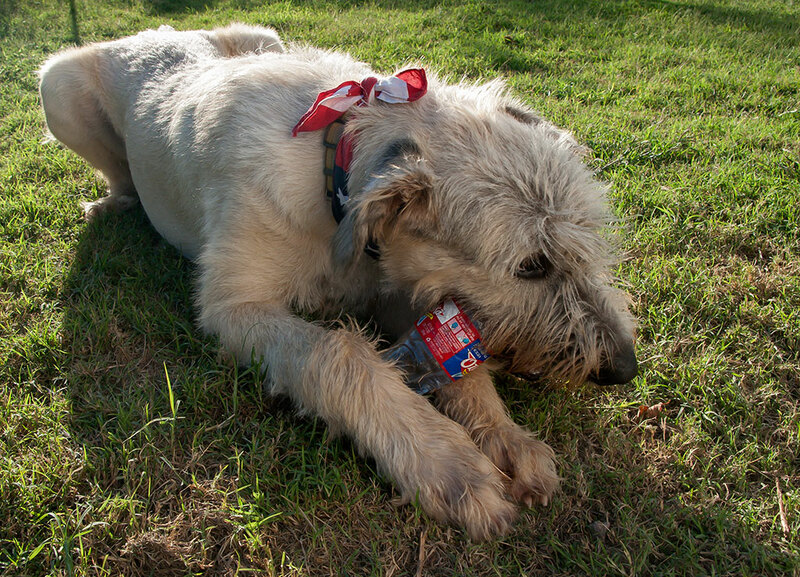 Hawken plays with his stolen water bottle. 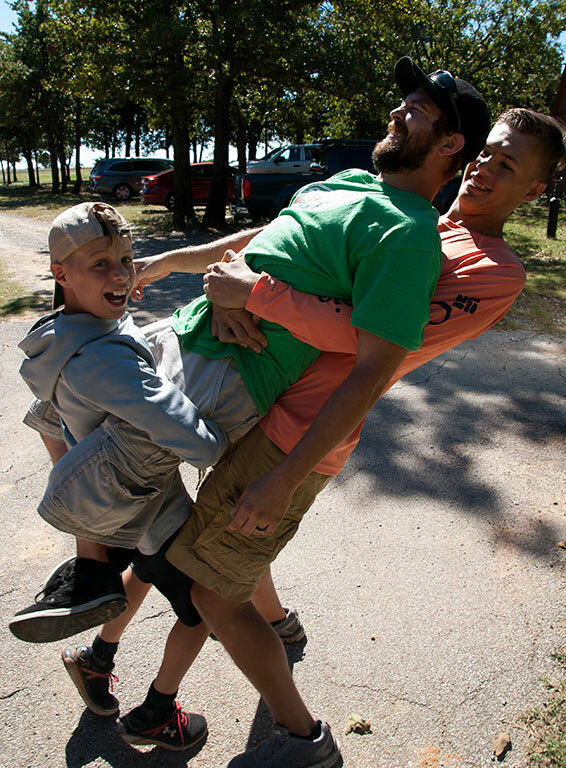 Shoffner reunioners are noted for their antics. Afterwards I took him for his second walk of the day. 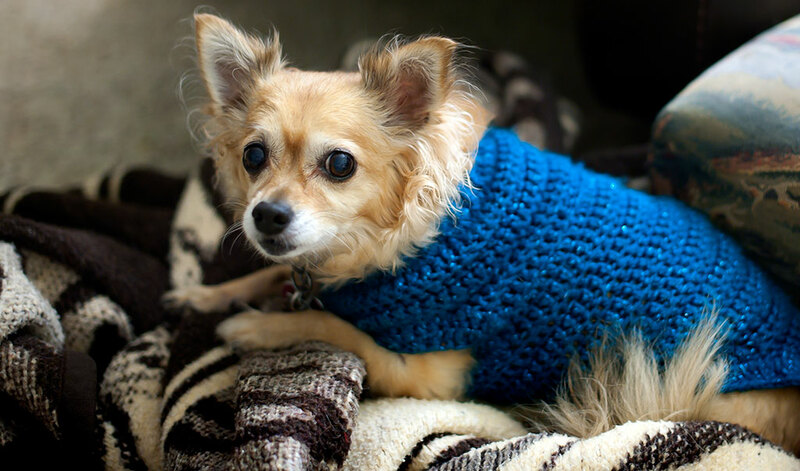 In other news, it was cold enough to put sweaters on the Chihuahuas last night. They love their sweaters, and come running when I bring them and offer to put them on. Also, as readers hopefully saw on my teaching blog, Abby and I attended her family reunion last weekend, and shot a bunch of senior pictures for Abby’s great niece Teddy, with great success. I will post reunion photos on the travel blog shortly. Donald Lee takes Teddy for a ride after giving one to my wife. Behind them are Abby and her nieces Amber and Rachel. 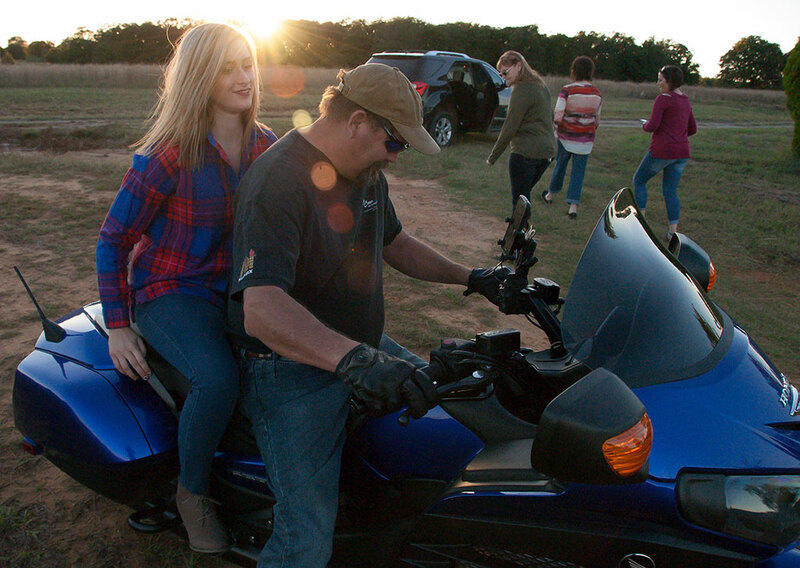 The Shoffner family photo session is a tradition. 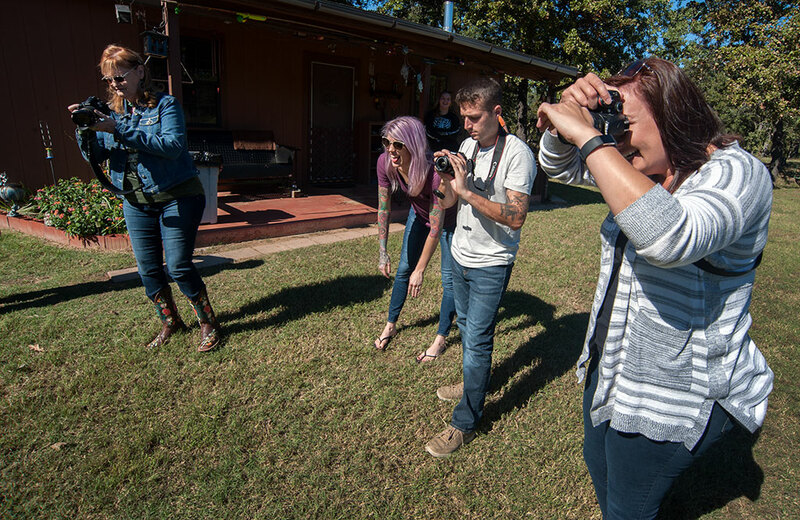 In this photo are Abby, Heather, Ryan, and Mechelle. Heather and Ryan were recently married in Las Vegas, which involved a helicopter. 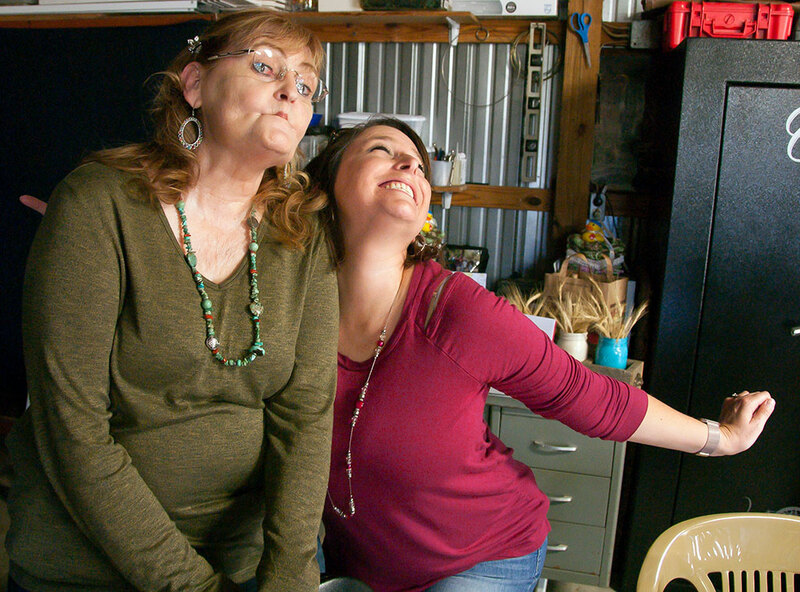 Abby and her niece Rachel try to look thin and fabulous for my camera at the Shoffner Family Reunion Saturday. Funny you should say that, because a neighbor dog named Hope got stuck in the back yard with Hawken Monday. 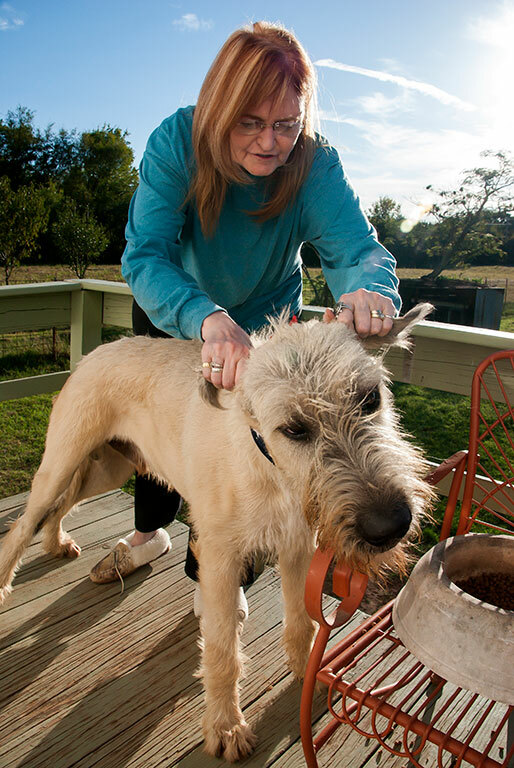 This reminds me that I need to get Leo trimmed up and take some photos of him. A small-ish bandana would look pretty smart on him. Great light in these photos, by the way. I especially like the vertical of Abby and Hawken on the back porch. The light is always great in the back yard on the porch in the afternoon and evening – the sun strikes the west-facing white wall of the house and acts as a fill reflector. Need to come out and see Hawken. Wonder how he and Leo would interact?